If you've been in the BI/ETL industry for several years you may remember that many years ago BI/ETL vendors actively promoted the concept of so called "BI standardization". Gartner, Forrester and other market analysts also talked about it -- organizations should stop having "zoo parks of systems" and standardize on one platform. At that time even the big BI vendors were only transitioning from a single-tool client-server architecture to a multiple-tool web-based one and many hoped that once they complete the transition organizations would be able to cover their data analysis needs with a comprehensive product set (platform) from one vendor. These expectations were driven by high cost and complexity of the analytical systems at that time, so standardizing on one platform would facilitate building in-house expertise, lower maintenance costs, and simplify support and administration. However, the reality turned out to be more complex. As a matter of fact it became clear that no vendor can offer really comprehensive product suite that would satisfy data analysis hunger of various types of users. The more users became involved into data analysis the more diverse and sophisticated needs they developed. 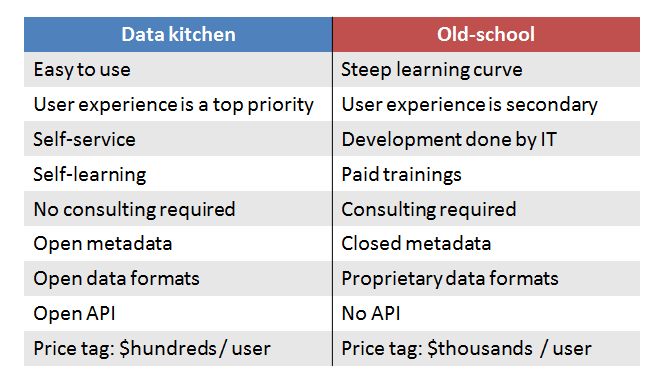 It seems to me that organizations are increasingly becoming ready to embrace the concept of "data kitchen" where users have a choice from many tools so that they can choose whether to use a "spoon", "fork", or "knife" for a job, rather than having just a "spoon" for all cases. However, the problem is that the vendors are not ready -- they still want customers to buy their expensive cumbersome enterprise platforms. Usability was long ignored but now it's the king. First, because data analysis is difficult, therefore I believe that software vendors should go the extra mile to design well thought out, clean and polished UI. Enterprise software should be smarter and simpler, even at a cost of removing some functionality (look at some popular mobile apps). Second, when you have many tools in your "kitchen" you can't afford spending a lot of time figuring out how to use each of them. A single tool may not require too much attention. Selfish ones don't survive in a team. Hence the necessity of open data formats and APIs. 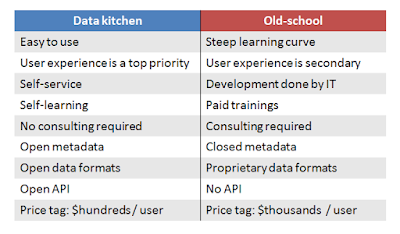 Open metadata is required for throughout data governance -- a must-have for a "data kitchen". Another note is about price. Cost structure per user will change. If previously an organization could spend $5,000 for one license for one user, one should not expect that because of the "data kitchen" organizations will start buying 10 tools for the same $5K each spending in total $50K per user. Instead they will be looking to offer a user 10 tools for $500 each. I believe those software vendors that resist the change and keep prices high will be eventually squeezed out of the market. You can check your favorite software against the table above. Some products are better suited to find a place in a "data kitchen", some are not. In my opinion Tableau is a good example of well thought out and polished user experience aimed for self-service use. I wish only they opened TDE and/or adopted some open format for data exchange. 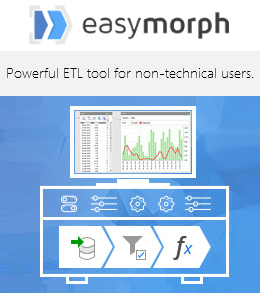 I hope EasyMorph can become another good example of a tool that is perfectly suitable for the "data kitchen" concept. We're living in an interesting time after all -- the BI/ETL market stagnated for long time, but now the pendulum has swung in the opposite direction and we can observe many interesting products coming to the market.